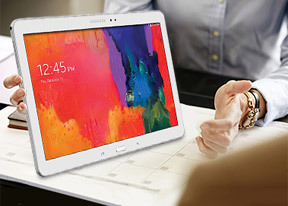 The Galaxy Tab Pro 10.1 comes in Wi-Fi-only and LTE flavors, the latter capable of voice telephony. Either way, both have the Contacts app - for email and IM on the Wi-Fi only version and for calls on the LTE version. As usual, the Contacts app syncs automatically with Google and your social networks, while you can choose which contacts to display. You can do everything a phonebook should be capable of: edit a contact, import/export, join contacts, send or print name cards, get friends via social services, etc. We have the LTE version in our office, so we managed to try the voice call feature too. We had no issues with reception or audio quality, though obviously you're limited to loudspeaker calling unless you connect a hands-free (wired or Bluetooth). The Galaxy Tab Pro 10.1 even supports 3G video calls for those who still use them. Many IM apps offer video calls, including Google's Hangouts and Samsung's ChatON. These are more widely supported, 3G video call support is rare outside of Samsung devices. Loudspeaker performance was a bit disappointing though - the sound is good and clear, but not very loud. Even the smaller Tab Pro 8.4 managed higher volume. The LTE version of the Samsung Galaxy Tab Pro 10.1 features the Messages app too, it handles SMS and MMS messages. It's the same apps we've seen on phones, except with a split-screen UI. Anyway, many people have switched over to Google Hangouts, which is an instant messenger that also supports SMS and MMS. Unlike iMessage, this app keeps IMs and SMS conversation threads separate. ChatON is not pre-installed, but it's a free download from the Play Store. The tablet also comes with the traditional duo of email apps - the Gmail app provided by Google and the Email client courtesy of Samsung. Both have a split-screen interface, support multiple accounts, bulk actions and folder view. The default Samsung Email app supports POP3, IMAP and Microsoft Exchange. It also offers a very useful Magazine widget, which will probably see lots of use if you are into email. The Samsung QWERTY keyboard occupies about half of the screen in landscape and about a third of screen in portrait view. There are two additional keyboard layouts to try out. You can opt for the small floating keyboard and a split keyboard. Choosing the split keyboard allows you to quickly thumb-type while holding the tablet with both hands. Other tablets show pop-up compose windows that neatly fit between the two halves of the keyboard, but this wasn't the case with the Tab Pro 10.1. Several other options are available to make text input easier, including dictation and various options for predictive text and auto correction. Swipe input is also supported or, if you disable it, you can swipe left and right across the keyboard to move the cursor. The large keyboard does have arrow keys anyway.